The Newport SL Series of Gimbal Optical Mounts is Newports high-resolution series. 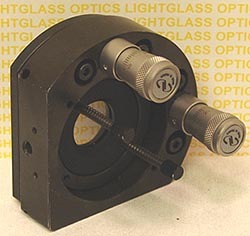 This SL25.4BM Gimbal Optical Mount has 2 mounting locations with 1/4"-20 thread to allow mounting on Newport Rail systems, posts or on a Rod mount. The price includes 2 Newport BM series micrometers and a removeable base. The central aperture measures 25.4mm and is perfect for mounting lenses, mirrors, filters or other critical optical components.